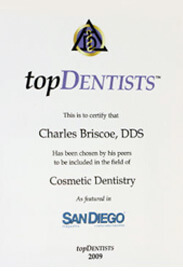 Dr. Charles Briscoe has been providing patients with high quality dental treatment for more than 32 years. A graduate of UC Davis and Georgetown University School of Dentistry, Dr. Briscoe is highly trained to deliver the most personalized and comfortable dental care around. 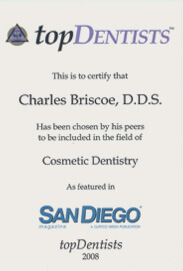 In fact, despite the stereotypical dread associated with dentistry, Dr. Briscoe’s San Diego dental patients report he is the most pleasant dentists they've seen, with a patient experience that is fulfilling and enjoyable. 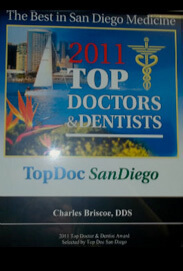 You will be pleased to know that Dr. Briscoe’s continued learning did not end with dental school. Dr. Briscoe and his assistants are trained in sedation dentistry through the National Dental Organization for Conscious Sedation. This organization was founded to standardize a system of study focusing on treating highly anxious patients. The curriculum is taught by experts who have developed cutting edge protocols based on pharmacology, physiology and patient psychology all geared toward making the highly fearful patient comfortable and relaxed during treatment. Dr. Briscoe is committed to staying fully current in all advances in treating this group of patients, striving to provide his patients with an experience that encourages return visits to maintain their dental health. 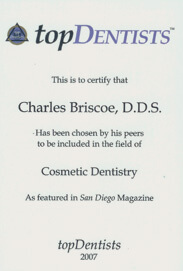 Dr. Briscoe has also received extensive advanced restorative training from the L.D. Pankey Institute, the Misch International Implant Institute, and advanced cosmetic training from the Las Vegas Institute for Cosmetic Dentistry. 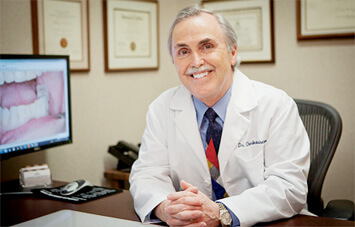 Additionally, he is a Fellow in the International Congress of Oral Implantologists, (ICOI) the world’s largest provider of dental implant education. The ICOI is dedicated to providing excellent continuing education to all members of the dental implant team so they can provide a superlative dental implant experience to their patients. Dr. Briscoe has met the demanding requirements of achieving a Fellowship designation which include meticulous documentation of dozens of implant cases to verify proficiency, attending 75 hours of continuing dental implant education, and being recommended by a current ICOI Fellow. 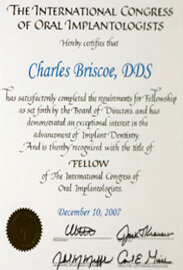 Dr. Briscoe is committed to continuing his understanding and furthering his skill in dental implant placement. 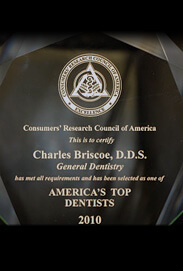 Dr. Briscoe’s devotion to his patients and his commitment to providing them with excellent dental services has not gone unnoticed. 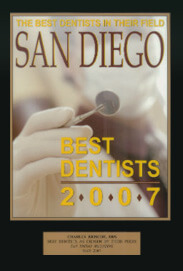 He has for the past several years, been voted by his peers as one of the Top Dentists in his area.